We’re a little over a month into the regular season – both at the Major League level and in the minors. With our hearts and minds so focused on the 2012 Toronto Blue Jays, it’s easy to forget about those that we’ve left behind in order to get to this point. Let’s check up on those forgotten ones – and see if we are better off without them. The Blue Jays absorbed 110 innings of lacklustre performance from Jo-Jo Reyes in the 2011 season before placing him on waivers in August. The Baltimore Orioles picked him up (of course) and he pitched even worse for them. Reyes was then jettisoned into the baseball abyss. The Pittsburgh Pirates signed Jo-Jo to a minor league deal and assigned him to their AAA affiliate in the International League. In 5 games (4 starts) he’s actually pitched well. That’s the thing with AAAA pitchers. They tease with promise, but only fail to deliver. Jo-Jo Reyes is definitely a AAAA pitcher. In his final seven starts, Eveland posted an 8.62 ERA in 31.1 innings. The Jays, looking to extract what little value he had, traded him to – guess who? – the Pittsburgh Pirates, in exchange for Ronald Uviedo. Eveland couldn’t cut it with Pittsburgh either, so it was back to the scrap heap with you, lad. This season Eveland is with – guess who? – the Baltimore Orioles organization. Everything really does come full circle in the world of a fringy left-handed starter. Like Reyes, Eveland was assigned to the AAA International League and has been playing well. It seems Eveland and Reyes follow an almost identical career path, right down to their nearly identical numbers at AAA this season. Eerie. Blue Jays fans may remember Ruiz from his torrid 115 at-bat stint in 2009 where he jacked 10 HR and posted an OPS of 1.019. Some prognosticators were even clamouring for Ruiz to take Jose Bautista’s roster spot, and really, who could blame them? Randy Ruiz fever was highly contagious. Eventually teams figured out how to exploit Ruiz’s penchant for free-swinging and a cure for Ruiz fever was found. 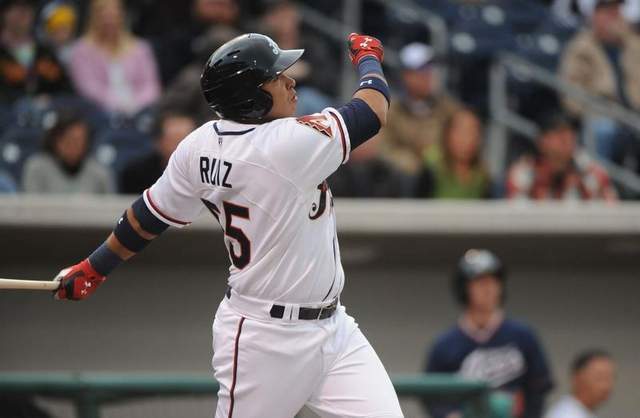 After 13 games in 2010, Ruiz was released. He went to GET PAID in Japan, and then an earthquake and massive tsunami hit. Ruiz, understandably, struggled considerably. When I met with Randy Ruiz in Puerto Rico this past winter, he mentioned that he hadn’t yet decided where he was going to play and was waiting for the right opportunity. With the departure of free-swinging Wily Mo Peña in Arizona, it looks like the right opportunity eventually presented itself. Looking to add depth and power, the Arizona Diamondbacks signed Randy Ruiz to a minor league deal near the end of spring training. Ruiz was assigned to AAA Reno of the Pacific Coast League, a place where he’s had success in the past: Ruiz was the PCL MVP in 2009. Ruiz is up to his old tricks, mashing like in days of yore. Of course, the glaring weakness of his that was exposed at the Major League level was his penchant for striking out – and he’s staying true to form in the PCL. So far Ruiz has struck out 23 times in 88 at-bats for a 26% strikeout rate. It’s not that big of a deal in AAA as long as he can keep the peripheral production numbers at present levels. If Ruiz can indeed keep this up, a second PCL MVP award could be in his future. After burning out in AAA Las Vegas last year, Lewis sought refuge in the last bastion of forgotten Jays players: the Atlantic League. I’ve got nothing really to say here other than the fact that it must be really, really, really heartbreaking to go from playing in the Show in 2011 to catching on with the Bridgeport Bluefish. Best of luck to you, Rommie. It sure beats delivering pizza. Interesting fact: he’s being managed by former Blue Jay Willie Upshaw. Apparently that wasn’t all that Chacin did. He also liked to get drunk and drive around intoxicated during the 6-week party zone known as spring training. With a new reputation for having “bad makeup” due to the drunk driving, coupled with a track record of injuries, Chacin’s options were limited to the Long Island Ducks of the Atlantic League. He hasn’t appeared in a game this season, so I can only assume it is because the injury prone Chacin is injured yet again. Let this be a lesson to all you kids: don’t drink and drive. Toronto’s leftfielder-by-default in 2011, Corey Patterson drew the ire of Jays fans for his misplays in the outfield and listless bat. The Brewers signed him this past offseason for minor league depth and he is doing much of the same as what he did in Toronto: not much. Patterson was originally the 3rd pick of the 1998 draft. It’s a shame that he was never able to fully realize his potential. Tallet is most known to Jays fans for being the quirky left-handed reliever who has been living off his above-average 2008 season for the past 3 years. Since then, Tallet has been BAD. He’s gone 9-17 with a 5.87 ERA in 251.1 innings while giving up 44 home runs. This winter he signed as a free agent with the Pittsburgh Pirates but even they couldn’t deal with his futility. They shipped him off to San Diego, and the Padres wisely buried him in their PCL affiliate. It’s too bad for Tallet, because the spacious confines of PETCO Park is probably one of the last venues that Tallet has a chance of pitching to some level of respectability in. You don’t need me to tell you what’s wrong with Tallet. Look at the numbers, but don’t look at them too close to bedtime. Adam Loewen was the feel-good Canadian story of a pitcher-turned-outfielder who made good on his comeback attempt with his hometown team. With a glut of big-league outfielders, the Blue Jays had no place for Loewen and released him so that he was free to sign with the New York Mets. This season Loewen is playing with the Mets’s AAA affiliate – the Buffalo Bisons – and is doing quite well for himself early on. Unfortunately, Loewen was just placed on the disabled list with a stress fracture in his right foot. There’s no word on how long he’ll be out for. Jeremy Accardo was acquired by the Blue Jays from the San Francisco Giants in exchange for malcontent and purveyor of bad juju Shea Hillenbrand. The following season he was thrust into the closer’s role and performed admirably; he saved 30 games, good for 15th on the franchise’s all-time single-season saves list. After that, it all went downhill from there. The Jays acquired RHP Josh Roenicke in a deal for Scott Rolen and Roenicke promptly took Accardo’s roster spot. After meeting with then-Jays’ manager Cito Gaston, Accardo threw his uniform in the garbage, thinking that he wouldn’t need it anymore. Accardo ended up at AAA Vegas, where he pitched well. 51s pitching coach Dan LaRoche was quoted as saying “He doesn’t belong here. He’s better than this league.” Shortly after, Dave LaRoche was fired. He was right though. Accardo is better than the PCL. The only problem is that he’s not as good as MLB. In his last two seasons at the big league level, Accardo pitched 44.1 innings while giving up 55 hits and walking 21 for an unsightly WHIP of 1.71. That’s just not going to get it done. Cleveland took a flier on him and sent him to their AAA affiliate and yes, it appears he’s better than that level judging by the way he’s performed so far. But that is most likely where his career will plateau, since he certainly can’t cut it at the Major League level. No need to fish that Indians jersey out of the garbage, Jeremy. 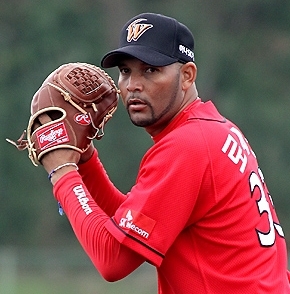 Another former Jays closer, Aquilino Lopez, has found his way to the Korean Baseball Association and is pitching for SK Wyverns. Most recently Aquilino pitched for the Detroit Tigers in 2008, and since then he’s parlayed a decent winter league season in the Dominican into a contract with SK. In 21.2 innings, Lopez has struck out 10 and walked only 1. He’s got a stellar 2.91 ERA and has only allowed 16 hits in those 21.2 innings. 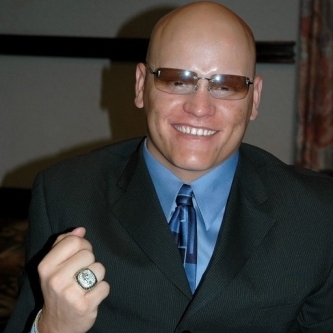 Technically Jason Lane never actually played for the Toronto Blue Jays, but he did play for their AAA affiliate in Las Vegas for the past three seasons. Lane is most noted for hitting 26 home runs with the Houston Astros in 2005, and ever since then he’s been trying to get the magic back. In 2010, Lane posted a .946 OPS for Vegas and muffled chants of #FreeJasonLane rained down on Twitter. It was not to be. Like Sergio Santos before him, Lane decided the only shot he had at getting back to the big leagues would be if he put down the bat and picked up the rosin bag: Lane converted himself into a full-time pitcher. Lane is Randy Ruiz’s teammate this year with the Reno Aces and so far the results have been interesting. In 19 innings pitched, Lane has struck out 16 and walked only 2. The only problem is that opponents are batting .349 against him: in those 19 innings he’s allowed 29 hits. He’s also notoriously easy to run on. It appears it might be a case of picking up the craft of pitching too late in life, but this story is worthy of keeping an eye on, if nothing else for the novelty factor alone. Photos courtesy of Liz Margerum/RGJ, MiLB.com, atlanticleague.com, and mykbo.net. Featured image courtesy of Julie Feinstein at Urban Wildlife Guide.